Alicia France, Self Portrait with Cat, 2017. 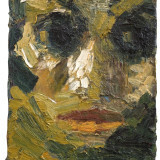 Oil on aluminium, 16.5 x 13.5 cm. Eighteen works have been acquired from the 2017 Ruth Borchard Self Portrait Prize exhibition by the Ruth Borchard Collection, the highest number in the history of the Collection. Self portraits by Michael Ajerman, Tracey Emin, Susan Engledow, Oli Epp, Amanda Ewbank, Alex Fowler, Alicia France, Rebecca Harper, Kimberly Klauss, Simon Klein, Jim McLean, Jennifer McRae, Howard Morgan, Ishbel Myerscough, Benjamin Ogbebor, Gideon Rubin, Tai-Shan Schierenberg, and Helen Wilson were chosen from the one-hundred and twenty shortlisted works which feature in the exhibition. The Next Generation Collection consists of eighty-six self-portraits and is continually growing, brought together through such purchases from the biennial Ruth Borchard Self-Portrait Prize. These significant additions to the Collection ensure that the Collection retains the dynamic growth and evolution with which author and collector Ruth Borchard began her Original Collection, and supports the work of practicing British artists. The 2017 Ruth Borchard Self Portrait Prize exhibition is at Piano Nobile Kings Place until 22 September 2017. Please visit the exhibition page for more details.